Region-free NTSC DVD; Picture Format 16:9. Sound format: LPCM 2.0 Stereo. DTS 5.1 surround. I first saw this film when it was broadcast on BBC television at Christmas 2011. I thought it was marvellous on first acquaintance and I’m delighted to find it now released on DVD. The film was made during two live performances at the Royal Opera House. This release has a number of things going for it. In the first place it has a stellar trio of principals, not one of whom disappoints. In addition the supporting cast, though their roles are fairly minor by comparison with the main characters, hasn’t a weak link in it. Then there’s the superb conducting of Antonio Pappano. Finally - and this is a major plus as far as I am concerned - the production is traditional in the best sense of the word and blessedly free from gimmickry and directorial conceits. Jonathan Kent’s production, rehearsed for this revival by Duncan Macfarland, is intelligent and faithful to Puccini’s concept. In describing it as “traditional” I don’t wish to imply for a second that it’s routine or boring for it is most certainly not either of those things. Instead Kent focuses on the three main characters and the interactions between them. The sets are impressive and straightforward - the church and the entrance to its crypt for Act I; Scarpia’s huge chamber, with the interrogation cell conveniently next door in Act II; and the rooftop execution yard of Castel Sant’Angelo for Act III. The costumes are of the period and look well and so far as we can tell on the small screen Mark Henderson’s lighting plot is highly effective and atmospheric. Kent and his team try no clever updating of the plot and there’s no puzzling symbolism. Instead, what we get is a straightforward, powerful presentation of Puccini’s plot. For me a key question with any opera is whether or not a newcomer to the piece could settle into his or her seat and understand what is going on. In this case the answer is resoundingly in the affirmative. Hurrah! So, everything onstage is well set up. Happily, the video direction is equally successful. Jonathan Haswell clearly understands the opera extremely well and his direction is assured, fluent and at all times relevant to the action. One benefit of watching on video is that you can see all the facial expressions which might not register if one were sitting further back in the auditorium. In this performance that’s crucial as the principals - and Terfel in particular - convey so much through subtle eye movements rather than through big physical gestures. Bryn Terfel is an artist about whom I’ve had some reservations in the past. His larger-than-life stage personality sometimes seems overdone and his excursions into the song repertoire on disc have often seemed to me to be over-expressive, to the detriment of the music: he can dwarf a song. However, a big-boned operatic role is much more his métier and he proves to be a superb Scarpia. Given that he’s playing one of the most notorious villains in all opera you may be surprised to find him making reference to the “stillness” in the role during the introductory feature. So much of what he does is achieved by facial expressions and with his eyes. His very first entry is hugely imposing and menacing simply because his physical bearing is so big. He radiates glowering menace and evil yet there’s no ham acting. Indeed, this is an unusually subtle assumption of the role. He does almost everything with his eyes and his voice and it’s all the more chilling and effective a portrayal as a result. Note, for example, the subtle sneer he gives after Tosca has sung “Dio me perdona. Egli vedi ch’io piango!” at the end of the dialogue between them in the chapel during Act I. The Act II confrontation with Tosca is searing in its intensity and once again it’s remarkable how much Terfel achieves through subtle means rather than overt histrionic gestures. He brings out the manipulative aspect of Scarpia’s character, both here and in Act I, with conspicuous success. Add to that the fact that he’s on superb vocal form and in my view you have pretty much the complete package here. Overall, his is a marvellous, dramatic performance, magnificently sung and acted. 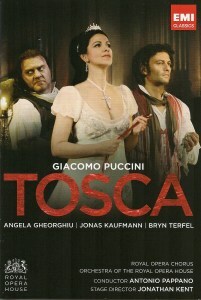 As Tosca, Angela Gheorghiu, who is also on top form, really delivers the goods. The role seems to fit her like a glove, both temperamentally and vocally, as she indicates in the introductory feature. In Act I, when duetting with Cavaradossi, she veers between knowing flirtatiousness and jealous insecurity. She’s completely convincing as the seductive, flighty diva who is difficult, if not impossible to tame. Her vocal timbre and the wide range of colour in her voice are most impressive and enable her to convey a wide-ranging portrayal of Puccini’s tragic heroine. Though her ardent Act I duet with Cavaradossi is superb her performance reaches an even higher plane during the long confrontation with Scarpia in Act II. This entire scene is riveting. At its heart is a moving and superbly delivered account of ‘Vissi d’arte’. In a piece of fabulous, expressive singing Miss Gheorghiu here portrays Tosca’s anguish at the prospect of the fate she faces at Scarpia’s hands if she gives way to his lust. It’s a showstopper and the audience acclaims it as such - then, in one of his expertly timed bits of acting, Terfel acknowledges her with three slow, sarcastic claps of his hands. When Tosca, in desperation and loathing, lunges at Scarpia and delivers the fateful knife blows Gheorghiu’s cries of ‘Muori’ are chillingly intense. She maintains this intensity, though in a different way into her third act dialogue with Cavaradossi, conveying first the ecstasy as she anticipates the deliverance she thinks she’s arranged and then her total despair as she realises that Scarpia has duped her after all. This is a wonderful portrayal of Puccini’s eponymous tragic heroine. However, despite the excellence of Gheorghiu and Terfel the show is stolen by Jonas Kaufmann. My attention was first drawn to him when his name was mentioned to me by a distinguished British singer, with huge concert and operatic experience, now retired. Towards the end of his career he had taken part in a production in which Kaufmann was involved and he told me subsequently that Kaufmann was one of the finest - if not the finest - singer/actor he had ever come across. This performance shows why such a judgement could be given. It’s not just that Kaufmann’s singing is superb - though it is in every respect - it’s the all-round performance that he gives that’s so special. Watch him, for instance, in the first few moments of the opera when he’s engaged with the Sacristan. Watch how naturally and easily he accomplishes little bits of “stage business” with his paint brushes and other props or how he applies just a few touches to his portrait-in-progress. Of themselves these little bits of acting are insignificant but when you think how many great opera singers haven’t been able to act to save their lives it’s refreshing to find one to whom stagecraft seems to come so naturally. Of course, all this adds to the character portrayal and makes it all the more convincing. Then he opens his mouth to sing. Kaufmann’s singing is simply glorious. It’s open-throated, ringing and sumptuous of tone with a thrilling dynamic range. He’s a tremendously ardent foil to Gheorghiu’s Tosca and everything he sings gives enormous pleasure and just sounds absolutely right. The big numbers - ‘Recondita armonia’ and ‘E lucevan le stelle’ - are memorable pieces of singing and the whole Act III duet with Tosca is memorably done. This is one of the finest assumptions of the role you could wish to see and hear. In the pit Antonio Pappano is absolutely in his element. His conducting has great dramatic thrust and the sweeping ardour of Puccini’s hothouse melodies is ardently conveyed. The ROH chorus and orchestra are on scintillating form. This is a stunningly good account of Puccini’s “shabby little shocker”. As I hope I’ve made clear, it’s anything but shabby in any respect. Instead the cast, players and production team bring this masterpiece of verismo thrillingly to life. It’s hard to imagine the opera being done more convincingly. A performance and production such as this leaves one in no doubt that the Royal Opera House is truly one of the world’s great opera houses. Bravo!